Please move your cursor on the Grades below to see sample concepts covered in each grade. Comparing, ordering, addition, subtraction, simple fractions, time, money, shapes, measurements, etc. Place value, geometrical shapes, measurement systems, multiplication, division, fractions, probability, etc. Multiplication, division, probability, data in charts & graphs, applied geometry, decimals, mixed numbers, etc. Large numbers, fraction manipulations, statistics, data and graphs, multiplying decimals, converting measurements, etc. Number theory, multiplying & dividing fractions, ratio and proportions, rates and percentages, permutation & combinations, etc. Introduction to algebra, integers, coordinate plane, functions, ratio and proportions, polygons, data & statistics, etc. Clear explanation of every UIL math concept each with 10 or more practice problems and 12 full length UIL Math tests. Hundreds of mental math tricks, shortcuts and concepts with lots of practice problems and 12 full length tests. 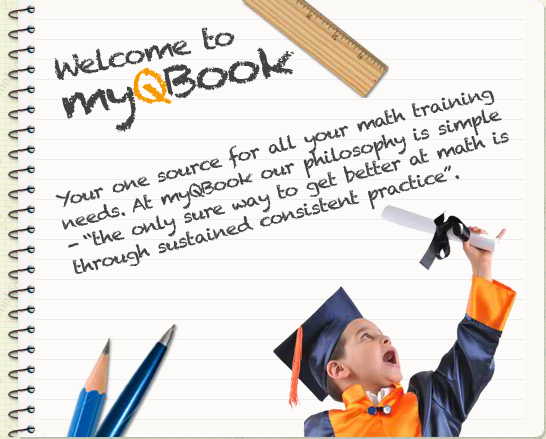 Participate in free monthly online meets at myQBook Meets and win Amazon Gift Certificate awards while providing your students additional practice for the UIL/TMSCA competitions.